This looks much better than Epics attempt, and I really like the merging and crossover. Im just wondering if there is the ability to copy the splines, as well as have meshes spawn along the side of the road at set distances? 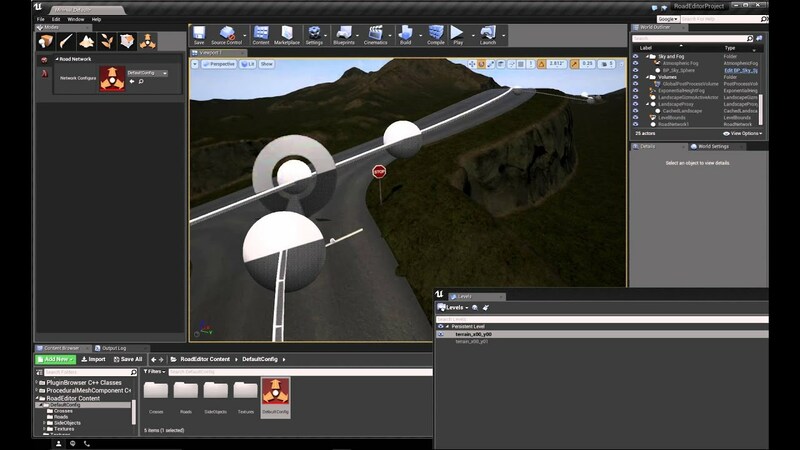 For instance if you wanted to have street lights following a segment of the road, could you automatically have them spawn a certain distance from the center or edge of the road, and have them spaced a certain distance away from eachother? This would be beneficial for stuff like guard rails, lights, sidewalks, ect. I cant wait to try this. I hope you release this soon. Hopefully this will come with multiple road types? You can put whatever mesh you want for roads and crosses. My meshes and material on it is just an example. Great work! Hope it makes it to the marketplace soon! Looks interesting and long overdue. do not seem to able to be release right away. But of course i will submit my plugin to Epic. We hope so, we can do a lot of things from this plugin, and affordable for indies. 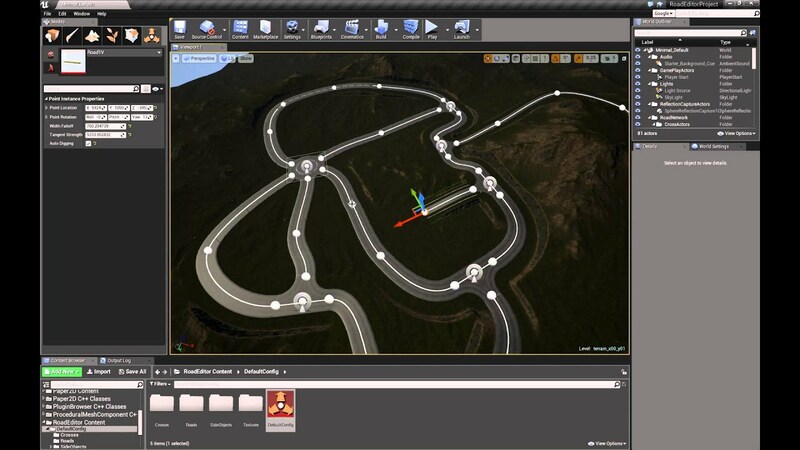 I forgot to say in the version after the release, we plan to add rivers and bridges, so you will be able to define " side spline " for your guard rails on a road, and activate desactivate on segments because rules and runtime can have different value, even if they share similar attributes at generation. I hope I made ​​myself clear. 2. Does this work with the world composition toolset? 3. Will this support Bridges? Little less than 100$ at start. Plugin main object is on persitent level. All game objects generated by the plugin belong to the level of the landscape on it. So if you hide a level, it will hide the road and unload height data for the landscape i work with. If the development is viable for me , version after release will inlude auto bridge rules and side splines. In fact it already support bridge if you disable auto digging for a road family. But you need to have a cross for transition beetween the road and the bridge. Last edited by Le Samedi; 02-11-2016, 11:02 PM. So, last question and I will leave you alone for a little bit. Are there any plans for open street map integration with this tool? I would like to import a file from open street map and just let the tool auto populate a neighborhoods road network. Yes i have work to do. There is a lot of plans for this tool, and openstreetmap data is in, everything about road in fact. For now we focus on release, and next, rivers and bridges with clear editor functionalities. The main goal for now is a designer tool that save a lot of time.